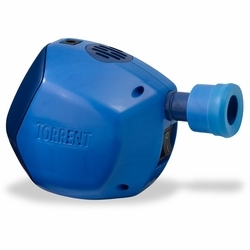 Therm-a-Rest NeoAir Torrent Pump. Designed for use with Them-a-Rest air mattresses, the Torrent Pump inflates a large NeoAir™ mattress in just 1.5 minutes. It’s strength lets you make your mattress as firm as you like, without worrying about over-inflating. It operates on four CR123A batteries (not included), or with the included DC car adapter. Fits all NeoAir mattress valves.